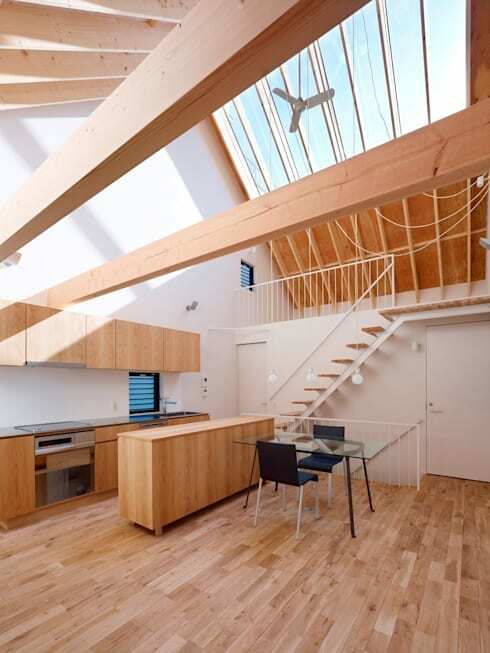 This unconventional abode is located in Japan and is the brainchild of SWITCH & Co. Interior Architecture and Design, who have managed to create a wonderfully unique dwelling. From the outside the home appears as a geometric, three dimensional box, but its intriguing frame conceals an open interior drenched in sunlight. The facade of this home is truly striking, with its stark combination of dark, timber panels and a glowing, white indentation definitely drawing the eye relative to its architectural surrounds. Once inside, however, we're embraced by an open and lofty atmosphere, in which white walls and wooden finishes prevail, dressing the home's novel design in classic decor. Despite its limited size, this abode definitely packs a punch in terms of flexibility, with multiple spaces delineated through contrasting decor and through the inclusion of an expanse of retractable doors, that can section the kitchen and dining spaces from the living area at will. 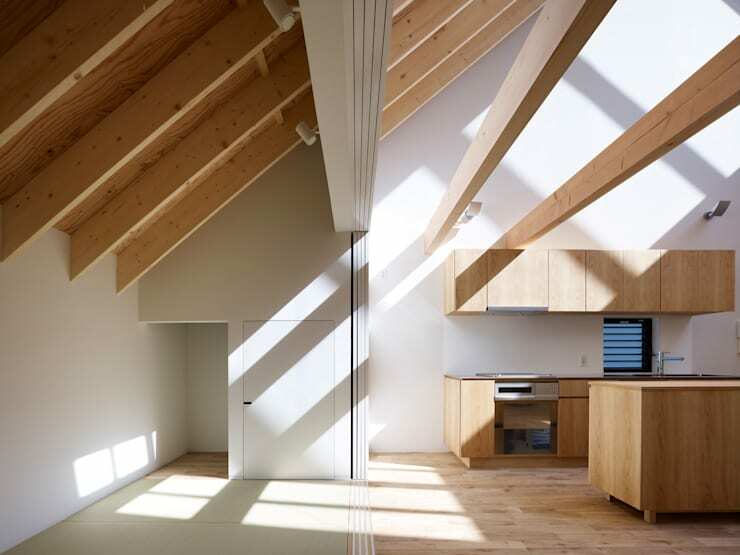 Also included is a wonderfully inviting mezzanine level, which rests pride of place beneath a generous array of skylights, allowing the occupants to make the most of the incoming sunshine whenever the mood arises. The facade of the home immediately draws focus with the depth of its three dimensional design, with streaming, horizontal wooden slats constructing the front walls and roof and a geometric indentation inviting entry into the intriguing abode within. The exterior of this home certainly presents a departure from the surrounding architecture, with the designers choosing to construct a dwelling that is simple, modern and engaging, with an alluring facade. 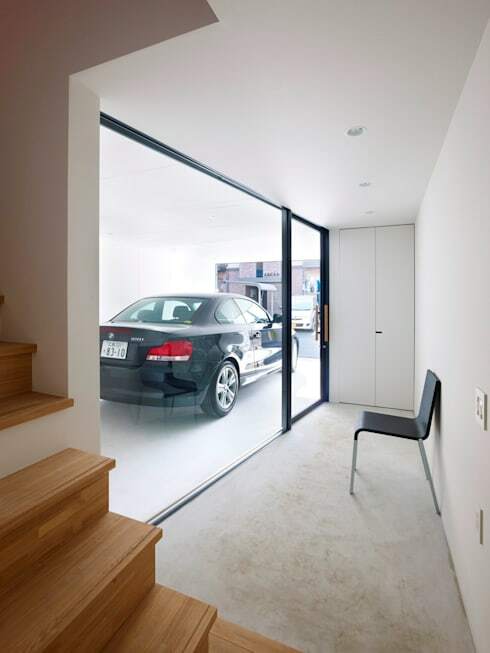 The white indentation seen from the home's facade is actually a crisp, contemporary garage, beyond which we're introduced to the interior through expansive, glass sliding doors. The interior decor already appears simple and modern, with polished concrete and white walls characterising the lower level and a classic, wooden stairway paving the way to the living quarters beyond. Once inside this unique home we are met with an open and lofty interior, in which pale wood and white comprise the decor. The flowing woodgrain of the flooring, kitchen and ceiling beams sooth the space with their soft colour and traditional texture, while stretches of glass stream overhead, drenching the dwelling in natural illumination. 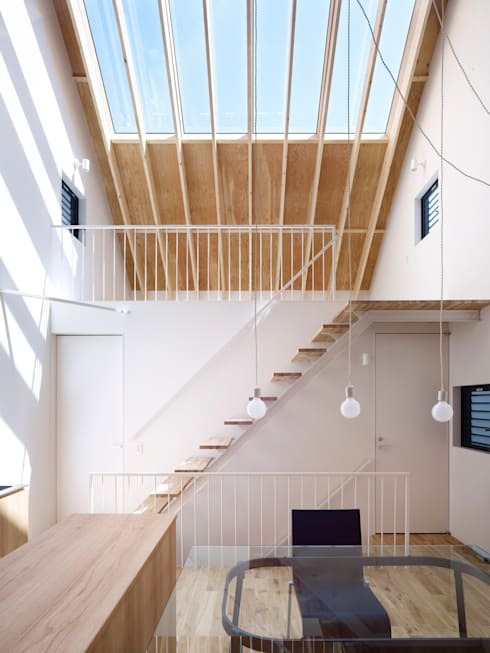 The ceilings within the home lift all the way up to its roof, infusing the abode with a sense of expanse by virtue of its height, even through the overall floor plan is relatively small. Despite the open design of this home, certain spaces have been delineated by virtue of contrasting decor. The kitchen within the abode is dressed predominantly in wood, with pale timber used to construct its cabinets and bench tops. The space adjacent, however, has been delineated through the use of contrasting, textile flooring in a pale, mint green, and can be further sectioned by a large set of siding doors which run the full length of the home, providing added flexibility and functionality. The lofty heights of this home have not been left unused, with a simple, wooden stairwell leading up to a mezzanine level, providing a relaxed, semi-private vantage that looks out over the open kitchen, dining and living area beneath. With the large skylight streaming overhead, this space beautifully harnesses the homes generous influx of natural light, providing the perfect locale to relax and enjoy warmth and rejuvenation. Did you like the expansive sunlights illuminating this unique abode? If so, you should also have a look at The Apartment of Bright Ideas! 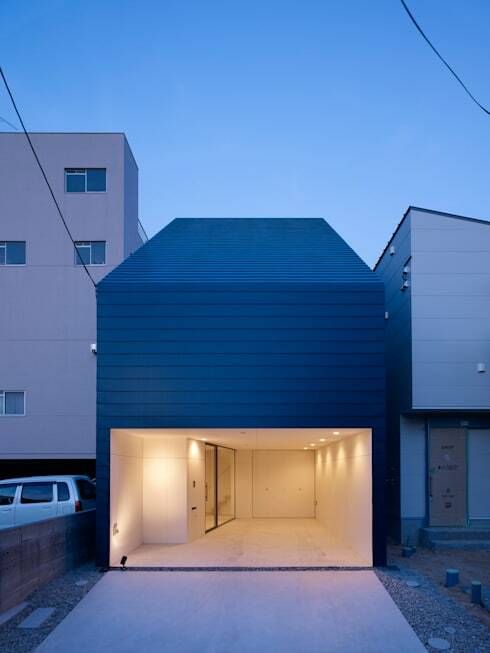 What do you think of the unique facade of this amazing dwelling? Tell us below!